Readings: Gen 37:3-4, 12-13ª, 17b-28; Mt 21:33-43, 45-46. 1/ First Reading: NAB Genesis 37:3 Israel loved Joseph best of all his sons, for he was the child of his old age; and he had made him a long tunic. 4 When his brothers saw that their father loved him best of all his sons, they hated him so much that they would not even greet him. 12 One day, when his brothers had gone to pasture their father's flocks at Shechem, 13 Israel said to Joseph, "Your brothers, you know, are tending our flocks at Shechem. Get ready; I will send you to them." "I am ready," Joseph answered. So Joseph went after his brothers and caught up with them in Dothan. 18 They noticed him from a distance, and before he came up to them, they plotted to kill him. 19 They said to one another: "Here comes that master dreamer! 20 Come on, let us kill him and throw him into one of the cisterns here; we could say that a wild beast devoured him. We shall then see what comes of his dreams." 21 When Reuben heard this, he tried to save him from their hands, saying: "We must not take his life. 22 Instead of shedding blood," he continued, "just throw him into that cistern there in the desert; but don't kill him outright." His purpose was to rescue him from their hands and restore him to his father. 23 So when Joseph came up to them, they stripped him of the long tunic he had on; 24 then they took him and threw him into the cistern, which was empty and dry. 25 They then sat down to their meal. Looking up, they saw a caravan of Ishmaelites coming from Gilead, their camels laden with gum, balm and resin to be taken down to Egypt. 26 Judah said to his brothers: "What is to be gained by killing our brother and concealing his blood? 27 Rather, let us sell him to these Ishmaelites, instead of doing away with him ourselves. After all, he is our brother, our own flesh." His brothers agreed. 28 They sold Joseph to the Ishmaelites for twenty pieces of silver. 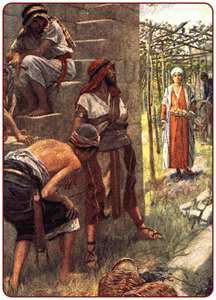 Some Midianite traders passed by, and they pulled Joseph up out of the cistern and took him to Egypt. 2/ Gospel: NAB Matthew 21:33 "Hear another parable. There was a landowner who planted a vineyard, put a hedge around it, dug a wine press in it, and built a tower. Then he leased it to tenants and went on a journey. 34 When vintage time drew near, he sent his servants to the tenants to obtain his produce. 35 But the tenants seized the servants and one they beat, another they killed, and a third they stoned. 36 Again he sent other servants, more numerous than the first ones, but they treated them in the same way. 37 Finally, he sent his son to them, thinking, 'They will respect my son.' 38 But when the tenants saw the son, they said to one another, 'This is the heir. Come, let us kill him and acquire his inheritance.' 39 They seized him, threw him out of the vineyard, and killed him. 40 What will the owner of the vineyard do to those tenants when he comes?" 41 They answered him, "He will put those wretched men to a wretched death and lease his vineyard to other tenants who will give him the produce at the proper times." 42 Jesus said to them, "Did you never read in the scriptures: 'The stone that the builders rejected has become the cornerstone; by the Lord has this been done, and it is wonderful in our eyes'? 43 Therefore, I say to you, the kingdom of God will be taken away from you and given to a people that will produce its fruit. 44 (The one who falls on this stone will be dashed to pieces; and it will crush anyone on whom it falls.)" 45 When the chief priests and the Pharisees heard his parables, they knew that he was speaking about them. 46 And although they were attempting to arrest him, they feared the crowds, for they regarded him as a prophet. The falling of South Vietnam event which happened on April 30, 1975 was called by many as the National Hatred Day; but also seen as an opportunity of many Vietnamese families to send many “Josephs” to foreign nations. These “Josephs,” after few years of settling down in foreign countries, brought their whole family from Vietnam to reunite with them. They also sent financial resources to Vietnam to save their relatives from hungry. When Vietnamese Christians looked back at this event, many recognized God’s wonderful providence. He achieved many good things from this tragedy. Today readings show us God’s wonderful providence; He achieved many good things out of human jealousy, selfishness and anger. In the first reading, the first Joseph was sold to the Egyptian merchants with twenty pieces of silver by his brothers because they were jealous and angry with him. But in God’s providence, Joseph became the Governor of Egypt and was prepared to save his family from famine and to bring his whole family to reunite with him in Egypt. In the Gospel, Jesus told us the story of God’s vineyard to illustrate human ingratitude and his future death. Again, in God’s providence, “The stone that the builders rejected has become the cornerstone; by the Lord has this been done, and it is wonderful in our eyes.” Jesus is the cornerstone which brings salvation not only for Israel but also to all nations. 1/ Reading I: Joseph’s brothers sold him to the Egyptians. 1.1/ His brothers’ jealousy and wickedness: Jacob, their father, had a reason to love Joseph more than his brothers because he had Joseph in his own age. When his brothers saw their father loved Joseph more than them, they hated and maltreated him. The opportunity for them to get revenge came when his father sent Joseph to bring food for his brothers, who were taking care of the flocks in the field. Joseph met his brothers at Dothan. When they saw him from afar, they plotted out of a plan to harm him. They said to one another, "Here comes that master dreamer! Come on, let us kill him and throw him into one of the cisterns here; we could say that a wild beast devoured him. We shall then see what comes of his dreams." Joseph had a special talent to interpret dreams. He dreamed many dreams and interpreted them to his father and brothers. In one dream, he dreamed that he saw his father and brothers to bow before him. This annoyed his brothers and was the reason why they called him “the master dreamer!” When Joseph was sold to Egypt, this special talent helped him to be set free from prison because he foretold the release of one officer who was confined in prison with him. It also helped him to become the Governor of the country because he interpreted Pharaoh’s dreams and brought foreign wealth to Egypt (Cf. Gen 37-41). In the Old Testament, dream is a way for a human being to understand wonderful but hidden things which God is going to do for human beings. Through these dreams, Joseph recognized God’s love and providence for him, his family and humankind. 1.2/ Human wicked plan and God’s providence: Joseph’s brothers wanted to kill him right from the beginning; but a brother, Reuben, found a way to save him by suggesting an alternative way: "We must not take his life. Instead of shedding blood, he continued, just throw him into that cistern there in the desert; but don't kill him outright." They threw him to a cistern which had no water. They, then, sat down to their meal. When they were looking up, they saw a caravan of Ishmaelites coming from Gilead, their camels laden with gum, balm and resin to be taken down to Egypt. Judah said to his brothers: "What is to be gained by killing our brother and concealing his blood? Rather, let us sell him to these Ishmaelites, instead of doing away with him ourselves. After all, he is our brother, our own flesh." His brothers agreed. They sold Joseph to the Ishmaelites for twenty pieces of silver. This Judah is the figure of Judah Iscariot who shall sold Jesus for thirty pieces of silver. Through the selling of Joseph, we recognized God’s providence; He used both Reuben’s love and Judah’ greed to save Joseph from death. 2.1/ The New Testament’s story of God’s vineyard: The reason why we called such a name is to differentiate with the Old Testament’s story of God’s vineyard, which Isaiah reported (Cf. Isa 5:1-7). Jesus used the allegorical style in his parable which his audience can figure out what and who were implied in the parable. We can list out the comparison as follows: The vineyard is Israel. The tenants are the Israelites’ leaders: priests, scribes and Pharisees. God’s servants are prophets through generations. The main different point between the Old and the New stories is the sending of the Son. When the tenants saw the son, they said to one another, “This is the heir. Come, let us kill him and acquire his inheritance.” Then, they seized him, threw him out of the vineyard, and killed him. Jesus wanted to dialogue with his audience to stimulate them to give a sentence for the tenants, by asking: “What will the owner of the vineyard do to those tenants when he comes?" They answered him, "He will put those wretched men to a wretched death and lease his vineyard to other tenants who will give him the produce at the proper times." The Scripture which Jesus referred in this passage is Psalm 118:22-23. Jesus wanted them to understand that God’s plan of salvation is fulfilling in the tenants’ hatred and wickedness. Jesus is the cornerstone which the Israel’s leaders are going to discard; but his death shall benefit all people, both the Israelites and the Gentiles. From now on, God’s kingdom is no longer limited in Israel but shall be opened up to all nations. There are nations which shall bring more benefits for God than Israel. When the chief priests and the Pharisees heard Jesus’ parable, they knew that he was speaking about them. As a set up, “they were attempting to arrest him, but they feared the crowds, for they regarded him as a prophet.” They couldn’t execute their plan because Jesus’ time didn’t come yet. When his time comes, they shall execute God’s plan of salvation exactly as planned by God. - God is organizing and controlling all things in the world. Human beings might think they are the ones who control, but actually, they are doing what are planned in God’s providence. - People, of course, still have freedom to co-operate or to oppose God’s will; but they can’t stop what God is already planned. He can use good and bad of human beings to achieve what He planned. - God’s providence is often difficult to understand; but we should believe it. If we can fathom all God’s providence, we are no longer human beings.